There is one cherished memory I have of my mother and grandmother; The Easter/Spring new dress. In my little community the two churches were the social fiber and second only to Christmas was the Easter celebration. A new dress was always in order for spring. My mother had exceptional taste and always dressed in the full feminine dresses of the 50's. A style I still envy. And don't get me started on her shoes. 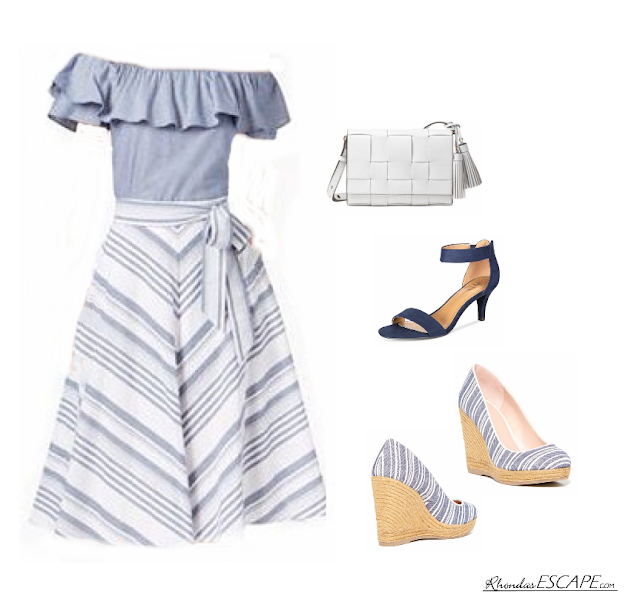 The dress above is from Macy's last summer and the Enzo Angiolini Steffo Platform Espadrille Wedges are from many season ago. When wearing the dress last summer, I kept thinking that I have shoes somewhere that match. Yes always "Shop your closet" first. They will work perfect. The other navy sandal is Macy's Style & Co Paycee. One of the reasons I ordered was they come in wide. With a strap across the front sometime just a little extra width can keep all the toes tamed and in place. They should come in a day or so and I will keep you posted. Also there are variety of colors and reasonably priced. All of this is not for an Easter service, although I do hope these choices would make my mother proud. My Mercedes Club has an indoor/outdoor event coming up in few weeks and this will work perfectly. Photos will be posted. What is your spring "ESCAPE" outfit?